© William Flaxington Adult, Lassen County north of Honey Lake. Adult, Lassen County © Debra Frost Desert Horned Lizards have one row of fringe scales on each side. 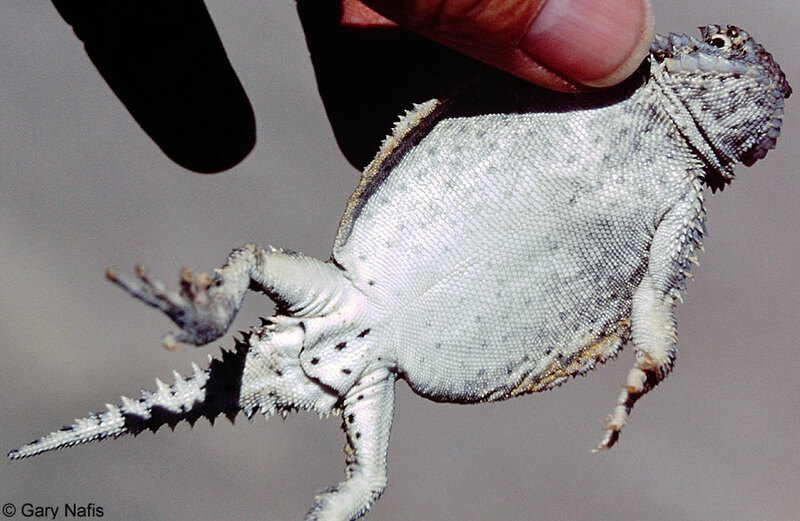 Compare with the Coast Horned Lizard which has two rows of fringe scales on each side. 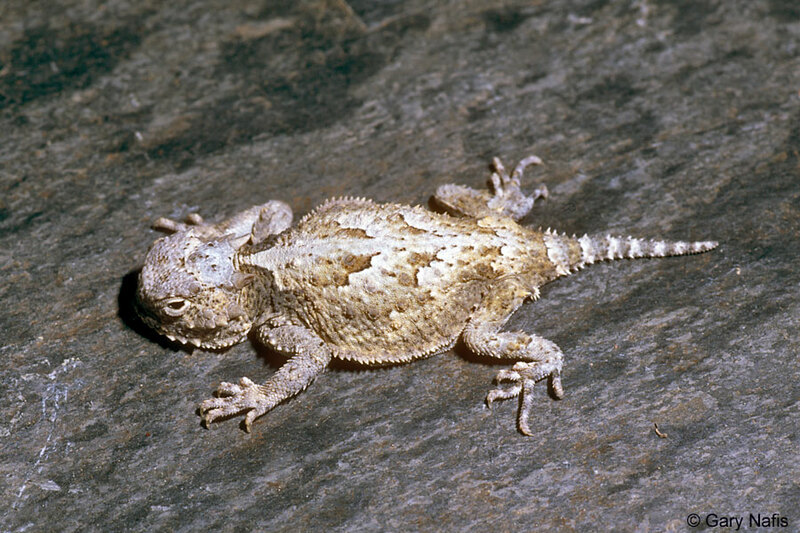 Desert Horned lizards are covered with small granular scales interspersed with larger pointed scales on the dorsal surfaces. I found this horned lizard basking on a rock on a cool morning in the Mohave Desert. It only had two speeds - sit still and hide, and run away as fast as you can. Walking around the Mohave Desert in Kern County one spring day I spotted several Desert Horned Lizards so I slowly followed them with my video camera hoping for some action. They did what they're designed to do - they ran in quick bursts a short distance, often under a bush, then they sat still hoping that their camouflage would make them invisible. Up to 5.5 inches including tail. A medium-sized flat-bodied lizard with a wide oval-shaped body and scattered enlarged pointed scales on the upper body and tail. The back skin is smooth with small spines. Horns extend from the back of the head, with the two central horns longest. Color can be reddish, tan, dark gay, beige, brown and even black in areas with dark lava. Background coloring usually matches the local soil and rocks. A pair of large dark blotches mark the neck. Wavy dark blotches mark the back. The belly is white with scattered small dark spots, smooth scales and black spotting at the vent opening. Males are smaller than females, and have postanal scales, femoral pores, and a wider tail base. Diurnal. Adapted to hot and barren habitats. Remains underground during hot or cold weather. Hibernates in loose soil, usually emerging in April. Most active from April to July. Can be seen basking on rocks and road berms in the morning and late afternoon - early evening. When threatened, this lizard is capable of running away quickly for only a short distance. It will often run under a low bush or into a rodent burrow to escape, or shuffle sideways to bury itself partly in the sand. Its main defense is remaining motionless using its cryptic coloring to blend into the background and make it difficult to see. It will crouch down low to prevent shadows that could make it easier to see, and sit still to avoid detection. When grabbed, it will inflate with air, hiss, threaten to bite, and move the head from side to side to jab with its horns. 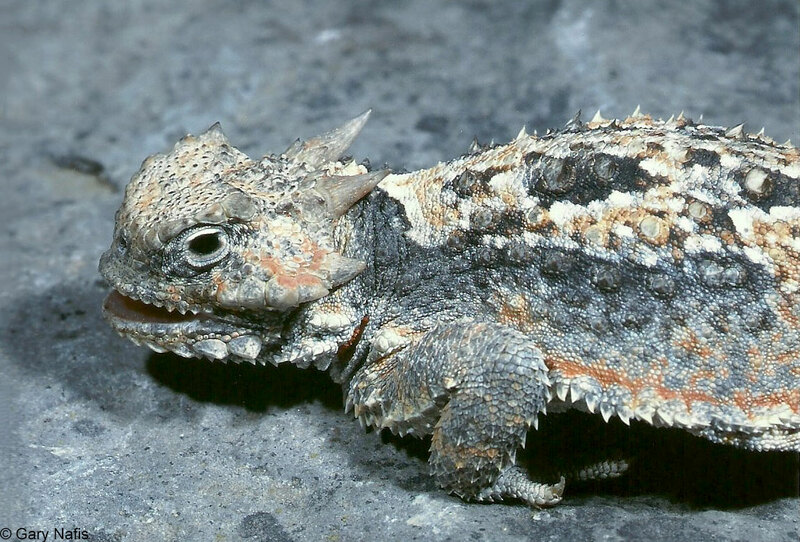 This species of horned lizard rarely defends itself by squirting blood from the corners of its eyes. 90 percent of the diet consists of ants. The remainder consists of other small invertebrates, including flies, and some plant material such as berries. 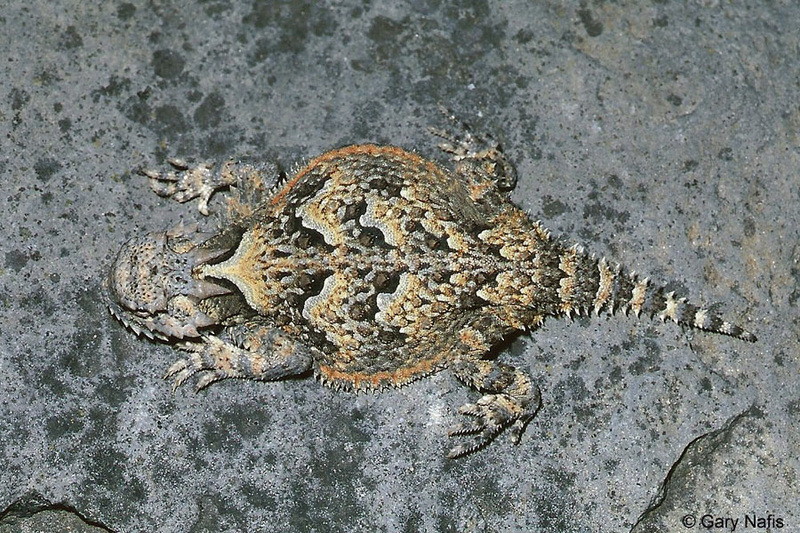 Although horned lizards may be desirable pets, captive animals normally do not live very long due to the difficulties of feeding them a proper diet of ants. Females lay 1 - 2 clutches of 2 - 16 eggs from June - July. Hatchlings appear usually in August to mid September. Inhabits sandy gravelly desert flats, dune systems with low brush, dry washes, and open hillsides with loose soil. Most often seen where desert shrubs are separated by wide sunny clear areas and near desert washes. Patches of sand or loose soil are generally present. Associated plants include sagebrush, big greasewood, saltbush, and other small shrubs. This subspecies is found in Great Basin Desert habitat at the far northeastern edge of the state. Found outside of California north and east into eastern Oregon, southwest Idaho, most of Nevada, western Utah and in an isolated location at the edge of the Utah Colorado border. 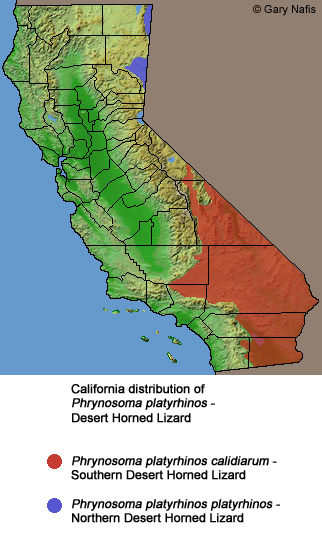 The species Phrynosoma platyrhinos occurs in southern California and northeastern Baja California, throughout most of Nevada, along the extreme northeastern edge of California, in southeast Oregon and southern Idaho, in western Utah and a couple of isolated spots in northeastern Utah, and western Arizona. Mulcahy et al. (2006, Mol. Ecol. 15:1807-1826) demonstrated that P. p. goodei is a full species, P. goodei, and showed that it occurs in the United States. Leache and McGuire (2006, Molecular Phylog. Evolution 39:628-644) named four subclades of Phrynosoma - 3 in our area: Anota, Doliosaurus, and Tapaja. Commonly called: "Horny Toad," "Horned Toad"
Sherbrooke, Wade C. Horned Lizards, Unique Reptiles of Western North America. Southwest Parks and Monuments Association, 1981. Sherbrooke, Wade C. Introduction to Horned Lizards of North America. University of California Press, 2003. Macey, J. Robert and Theodore Papenfuss."Herpetology." The Natural History of the White-Inyo Range Eastern California. Ed. Clarence Hall. University of California Press, 1991.